My boyfriend and I wanted to be something unique and funny this year for Halloween. Neither of us wanted to be the average couples costume so we started brainstorming ideas of things that go together or things that are opposites. When I came up with the idea of the birds and the bees he loved it! I started thinking of ideas of the easiest and cheapest ways to make the costume because we did not have a lot of time and we are both poor college students. 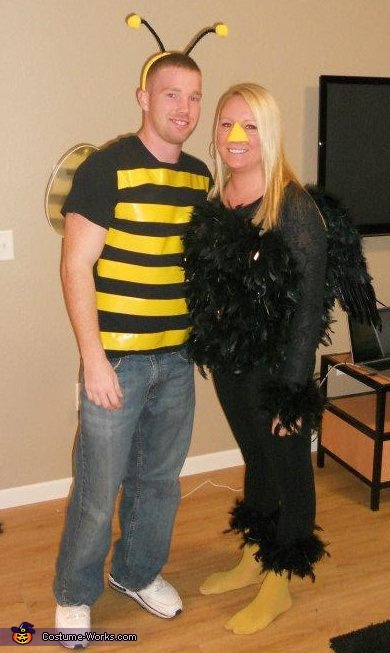 He decided he wanted to be the bee and I would be the bird. I had some old bee accessories at home that I had bought in high school that worked perfect for his costume. They included wings, a stinger, and antennas. For his shirt we just took a plain black shirt and used yellow duct tape for the stripes. For the bird costume I wore all black with yellow tights underneath for the feet. I bought 3 boas that I wrapped around my body as well as my wrists and the end of my pants. For my wings I bought black wings from the store. I made my beak out of yellow felt which i bent and glued onto yellow paper. I used elastic to tie it around my head. I made a tail out of black feathers which I hot glued together.